(Phys.org) —When hydrogen is produced from water during electrolysis, some energy is lost as tiny bubbles. In a new study, researchers have demonstrated that 25-nm transistors—so small that they're considered zero-dimensional (0D)—can be used to transform this lost energy into electric pulses. Millions of these 0D transistors could be used to detect individual bubbles and generate electric pulses at an optimal efficiency, gathering part of the energy lost during electrolysis and making it available for other uses. The researchers, Nicolas Clément at CNRS in Villeneuve d'Ascq, France, and his coauthors, have published their paper on using 0D transistors to harvest energy from bubbles in a recent issue of Nano Letters. As one of the most promising approaches for producing hydrogen as a fuel source, electrolysis involves applying an electric current to water to separate the oxygen and hydrogen atoms. During electrolysis, gas bubbles are formed, causing some energy loss. "All the mechanisms of energy loss during electrolysis are not fully understood," Clément told Phys.org. "Such a device, combined with high-precision cameras, may improve understanding in the future. Sources of energy loss are either diffusion of hydrogen in water or movement of counterions around electrodes during bubble emission." To demonstrate how 0D transistors can recover some of this energy, the researchers placed a 0.2-microliter droplet of salt water in a microbath. Underneath, they placed a transistor and two electrodes. 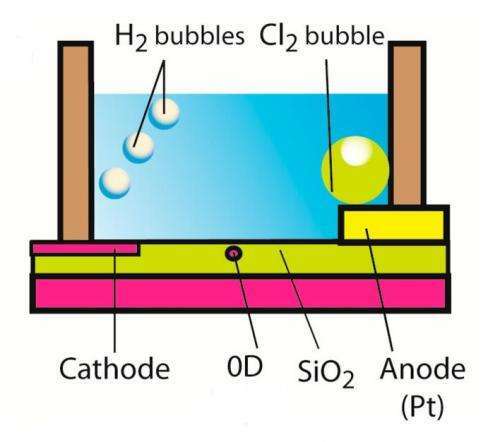 Under an applied voltage, relatively small (18-24-?m) hydrogen bubbles were emitted at the cathode, while larger chlorine bubbles were emitted at the anode. Increasing the voltage resulted in an increase in the bubble emission frequency. The 0D transistors could detect individual bubbles, and bubble size could be evaluated by analyzing changes in current. By detecting the bubbles, the transistors transformed the bubble energy into electrical pulses. In theory, 2 million 0D transistors could fit below the microbath, which results in an output pulse power of 500 ?W and a pulse power efficiency of about 99%. "There are three novelties," Clément said. "First, we use a 0D transistor in liquid whereas researchers have previously focused on 2D or 1D transistors (such as nanowires). Second, we show that we can detect electrically single bubbles, which is of great importance for electrochemists to understand and optimize electrochemical processes. Third, we show that we gather energy lost to generate electrical pulses at optimum efficiency. Historically, some researchers have tried to gather part of energy lost during hydrogen production by using a rotary apparatus (several patents can be found). Here we propose a new way." The ability to detect tiny bubbles and convert them into electric pulses could have a variety of applications, such as lab-on-chip devices for hydrogen storage. Another potential application is in physiology, since the electric signal has a similar amplitude as that of the action potential in a neuron. Here, the system could be used as an artificial action potential generator to perform local neuron stimulation with tunable amplitude and frequency. In the future, the researchers plan to demonstrate other applications with 0D transistors and better understand their behavior in liquid. So Phys.org now has a timer that logs me out as I write a comment, then says I am not allowed to add a comment, and then when I try to copy my comment a script kicks in and my content is lost since it copies their added Phys.org link instead of what I had selected. The grand puzzle now is how can I possibly copy this new message w/o losing it too? I believe leaving out the last period works and adding it back later. Nope! How about logging back in from a separate tab? Each unit cell of silicon is 0.54 nm and represents eight unique atoms so a 25 nm square transistor has 46 cells along each edge or 2116 cells total which is 17K atoms with the exposed face having about half that, and along each edge there is thus only about 92 atoms. Electrolysis of brine (2H2O+2NaCl) gives you Cl2 plus H2 plus 2NaOH. What to do with the chlorine gas? A more realistic example might be the electrolysis of water to yield H2 plus O2. Need pure water plus an electrolyte to allow the water to conduct electricity. We're generating tons of innovations for producing hydrogen gas. But innovations for compressing and storing it? Not so much. Or at all. Those are the technical problems preventing wide-spread adoption of hydrogen as a fuel. Until those are successfully addressed, hydrogen isn't much good. We're generating tons of innovations for producing hydrogen gas. But innovations for compressing and storing it? Metal organic frameworks (MOF)? Carbon nanotube storage? Glass capilarry storage? Hydrates? And then there are a ton of new chemical ways of storing hydrogen in development. That storage lags behind production isn't really surprising. Only makes sense to think about storage once you can show that it's (economically) feasible to produce the stuff. Some of the proposed methods are already good enough for central storage (as buffer systems for renewable energy economy). Whether hydrogen will be the fuel of choice for cars (or whether it'll eventually be batterise, or a fuel replacement like ionic liquids) remains yet to be seen. A black box effectively converts hydrogen in the Sun to compact liquid hydrocarbons on Earth with each carbon chain atom capturing one H2 molecule. When reacted with freely available O2, each H2 jumps over to an O atom to make water, and each C reattaches to a full O2 molecule to give plant food. That hydrocarbons are already buried deep in the ground is great news for plants and the animals that eat them now that Global Warming via massive water vapor amplified greenhouse effect has been called off not just by mavericks but now mainstream climatologists like Dr. Hans Von Storch. "Based on the scientific evidence, I am convinced that we are facing anthropogenic climate change brought about by the emission of greenhouse gases into the atmosphere." - "Statement to the U.S. House of Representatives Committee on Energy and Commerce, July 19, 2006 Hearing "Questions Surrounding the 'Hockey Stick' Temperature Studies: Implications for Climate Change Assessments""
In what language does that translate to "the greenhouse effect has been called off"? He's a 'climate realist' - not a denier. I did not see the word Palladium in this article, but lately I am wondering if the Pons and Fleischmann Palladium "cold fusion generator from the late 80s was actually a fuel cell.